Finally, after 2 slow weeks, we got some new stuff to spend our money on. A lot of stuff. And it is just a beginning. So get your virtual wallets filled, but before that, check what marked last week. Ready or not, here I go. On Monday, we got a 'regular' store collection release - This week in Bonjour Bisou. Personally, I am not a huge fan of the collection, but people seem to like it. There are some interesting pieces, some starcoin items, most nice, winter clothes, perfect for this season. If you dress your doll according to the season, of course. I'd rather make my doll wear long or short dresses as I am not much an expert at combining stuff. Anyway, I don't think I'll be buying a single thing from this collection. On Wednesday, we got a new PPQ collection - well, at least the part of it. It is pretty nice collection, I think. And not just because it is real brand inspired, but I truly like the most of the pieces. Especially the white dress and purple long coat. I love the shoes as well. We got this floor that day, and another on Friday. PPQ remains as one of my favorite stores on Stardoll, mostly because it isn't time limited, and stays a long time in plaza in most cases, yet gets updated every once in a while. And I am in love with purple as an overall theme of the collection. The same day, Stardoll announced 30% off sale on Tingeling Halloween Tribute store and Film Theory - Addams Family collection. A going away' sale to be precise. 2 things that made me happy - we got an announce that the stores were leaving the plaza, and we got even a sale. Not a 50% off sales as we got used to, but seems like Stardoll has ditched that 50% off sales completely. We got 'only' 30% off, which is actually fair deal. Of course, I wasn't gonna risk store leaving without the notice, so I already had bought my favorite stuff from the Tingeling store. Still, I spent some more stardollars to buy some additional items - a girls just can never have enough clothes, right? And on Friday, just like in some countries, we got Black Friday on Stardoll as well, which is going to last until the end of the day. Yay. finally a decent sale! Like a real sale, like the ones we used to have every month back about 5 years ago... Okay, it is not exactly 50% off, but rather going from 25% to 40% off. Most of the stores got the sale, except for limited stores, or some new collections. Christmas is coming soon, and it is a perfect time to spend some money on your favorite stuff, buy something you had on wishlists for a while, or you were planing to, but kept waiting for a sale - here it is, and you better hurry. I myself spent over 600 stardollars, for about 70-80 items, mostly clothes and accessories, which is the price I sometimes pay for a single item, and I saved up enough so it was worth it. It is true that sales make us buy stuff we haven't really planning to, but still don't want to miss getting a nice discount. 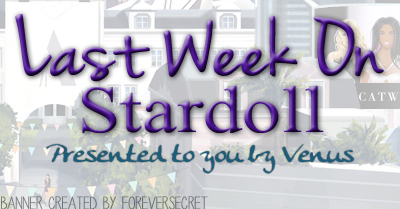 And I know some may not agree with me, but there are clothes in starplaza that have been there since I first joined Stardoll, about 6 years ago, so it may be a good time for them to leave permanently after the sale. Another thing I wanted to mention is that we got new 3 design templates for interior, for Christmas stuff. (There is also a sock and some triangle thingy too, fyi.) Anyway, Stardoll has decided to out our creativity to test, and instead of selling us overpriced trees and ornaments, they now give us option to design some by ourselves. Price is fair, but what I do not like much is the lack of a detail, and the tree looks kinda 'flat'. I am hoping we'll get some real new X-mass accessories for other not-so-talented users, and lazy ones (raises hand). Yeah, speaking of, get ready for Christmas Hot Buys calender, starting tomorrow. Fingers crossed for some nice and cheap items. Whew, what a week. Told you so. I hope you have still some stardollars left for a tribute season. I know I will be renewing my membership eventually to get some more stardollars. And of course, the holidays are coming so we can expect for more and more releases. But you asked for it, so don't complain if you get broke :) It is just a game, after all, so just enjoy. Oops, forgot to mention. Vote on the poll, leave a comment, as usual, and see you next week.